which is non-singular; that is, the curve has no cusps or self-intersections. Formally, an elliptic curve is a smooth, projective, algebraic curve of genus one, on which there is a specified point O. We now know that equations of degree 3 are in some kind of border area between equations of lower degree (easy) and equations of higher degree (very hard). Avner Ash; Robert Gross (12 March 2012). 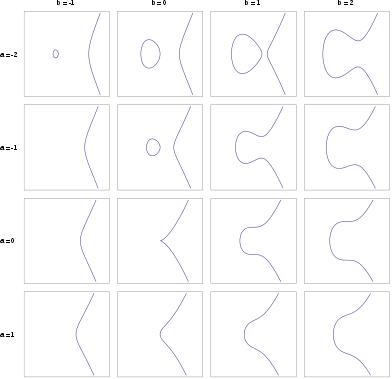 Elliptic Tales: Curves, Counting, and Number Theory. Princeton University Press. p. 3. ISBN 1-4008-4171-2. Michael Harris (30 May 2017). Mathematics without Apologies: Portrait of a Problematic Vocation. Princeton University Press. p. 26. ISBN 978-1-4008-8552-7. Neal Koblitz (3 May 2009). Random Curves: Journeys of a Mathematician. Springer Science & Business Media. p. 303. ISBN 978-3-540-74078-0. For about 1500 years, from the time of Diophantus to Newton, elliptic curves were known only as curves defined by certain cubic equations. This put them just a step beyond the conic sections, and some of their geometric and arithmetic properties can in fact be viewed as generalisations of properties of conics. Abe Shenitzer; John Stillwell (2002). Mathematical Evolutions. Mathematical Association of America. p. 133. ISBN 978-0-88385-536-2.